Thirty-something years ago, on an icy August afternoon, we travelled north of the city to inspect a property advertised in the Weekly Times. The directions were skimpy, but eventually we found the turn-off to Cathedral Lane – in the shadow of Cathedral Mountain – and the grey metal bridge over the Little River, to which the particular patch of land in which we were interested had a frontage. Today the property is described as picturesque, but by no wildest stretch of the imagination could one have used that particular adjective then. Shivering, despite being clad in thick woolly jumpers, drizabones and gumboots, we braved the incessant rain, skirting tumble-down fences as we trudged through swamp, blackberries, thistles and mud. Then for a few brief moments the rain paused and the clouds gave way to patches of light blue sky. The hills glistened in the pale Winter sunshine and a small Swamp Wallaby darted through the kunzea. Entranced, we watched, as he faded into the bush. As we climbed on up the hill, we knew we’d found the place to build our dream! Six weeks later, the 200 acre Taggerty property, bounded by the rushing waters of the Little River and the imposing Blue Range, was ours. We named it Kingbilli and the following year work began. A road was bulldozed through to the site we’d selected for the homestead. 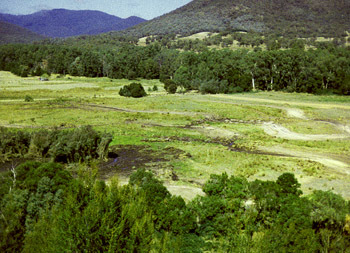 The weed-infested swampland was drained and replaced with two large dams connected by a shallow canal and filled with native reeds and lillies. Paddocks were fenced and landscaping began with hundreds and hundreds of trees and shrubs being planted. 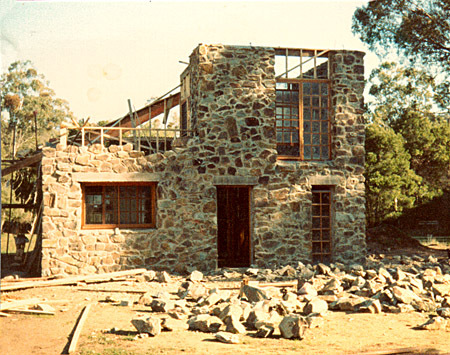 By mid-year work was under way on the first of the bluestone buildings. Georgina was born, bringing a marvellous new dimension to our lives. Farming began in earnest and with it came a huge learning curve. We learnt to shear goats, class fibre and trim feet. There were vaccinations and drenching. Our new and much prized Cashmere buck arrived. Cashmere does were graded and sorted into specific groups and joining got underway. Cashmere prices boomed. Shelters were erected in preparation for Spring kidding. Holding yards were built and the shearing shed went up. We settled into the seasonal pattern of country living. The physical work was hard and the days long … but the rush and tension of city-living was gone. What wasn’t completed today was dealt with tomorrow. The seasons dictated our job-list. Goats were joined in April and shorn in July … with kids arriving in September. Mares foaled in November. Hay was cut in December … and we ploughed and sowed paddocks in March. 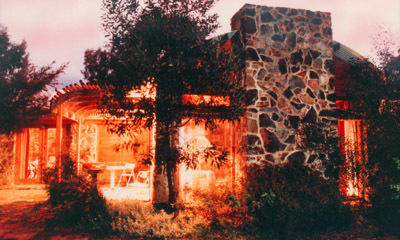 In 1985, we added guest cottages to the equation, though this was more by accident than design. During the early years, friends and family, visiting to observe and assist us in our endeavours, began sending first, their friends – and later, business associates – to stay with us for a ‘quiet few days in the country’. Soon, this influx of weary city-dwellers developed an impetus of its own. What had been built as a family guest cottage was booked for months ahead! Presented with the opportunity to diversify, we took advantage of this, converting the bluestone stables into two mews-styled cottages – Ballards and the Studio – and much to our delight, these proved to be just as popular as the Cottage. 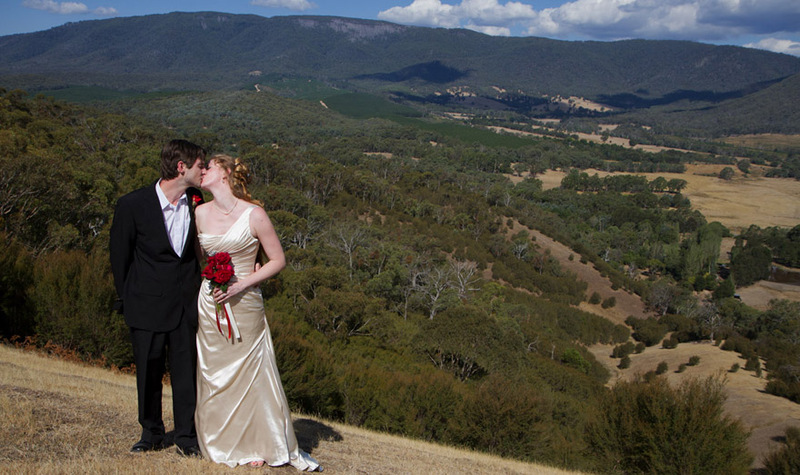 The Yarra Valley wineries, Marysville, Lake Mountain and our own Cathedral Valley and the Cathedral Range State Park were within easy reach of the Melbourne CBD, so we were fortunate in our location. The cottages were fully self-contained and the rustic theme of bluestone, timber and slate was maintained. Guests could be totally private and independent, allowing Melbourne based folk treated them as they would their own holiday houses or weekenders, enjoying the chance to get their children out of the hustle and bustle and into the fresh air. Many – who shared our interests – returned regularly and new friends were made. Travellers from interstate found it a restful holiday destination and international guests enjoyed experiencing Aussie country living first hand. Some wanted nothing more than to sit by the fire or in the garden with a book. Others sought more active pursuits. Boating, bushwalking, “rustic hit and giggle” tennis and cycling available on the property … with horse-riding, golf, hot air ballooning and abseiling nearby. Skiers, too, were catered for with downhill and nordic skiing at Mt Buller and Lake Mountain. 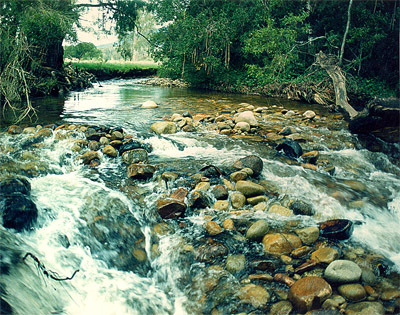 The Little River, boasting crystal clear mountain waters, separated Kingbilli from the rest of the world and provided a perfect spot to while away Summer evenings hoping to glimpse a Platypus or two. One young couple became frequent visitors. Sometimes they came alone … sometimes with friends. We saw them almost monthly – and not surprisingly came to know them well. Georgie, now four, became very attached to Sally. Stephen too, seemed a favourite. One Sunday afternoon, they announced their engagement and, as all their courting had occurred here, asked to be married at Kingbilli. “A small affair,” they said, “more like an elopement” … with Georgina as flowergirl. It was not quite as small as we’d envisaged – but wonderful all the same – and although we were unaware of it at the time, was to become the first of many such happy occasions. Happily, our ecological efforts began to take effect and the ever-increasing numbers of native birds and wildlife were winning visiting hearts. Those out for an evening stroll might see an echidna dining, a mob of kangaroos grazing, or even a pair of shy wallabies sitting on the hill. 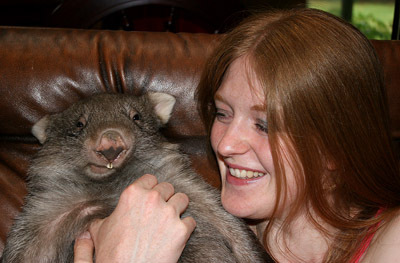 Wombats and Possums came out after dark, often wandering near the cottages. Very obligingly, one particular Platypus, took up residence in the banks of the creek, behind the cottages … though only the very quiet and patient observer was rewarded with an introduction. Koalas were re-introduced into the area and two were spotted in the tree-tops along the river. And, much to our delight, a group of King Parrots installed themselves in the gardens, appearing most mornings for breakfast. Meanwhile Kingbilli continued to evolve. Llamas were added to the farming enterprise in 1995, becoming a source of great interest to all comers. 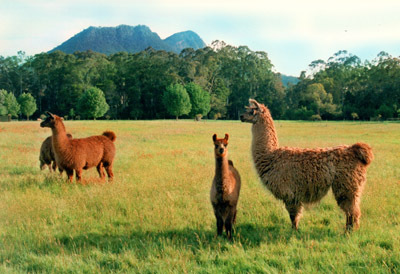 Llama-trekking was added to the list of activities available to guests and soon proved to be a very popular past-time. By 2000, Georgina – now grown into an extremely capable young woman – was becoming increasingly involved with the running of the property and soon began to add some innovations of her own. Already a keen, but sensible, conservationist, her aim was to ensure Kingbilli combined environmentally harmonious agriculture and on-farm conservation with interactive ecotourism. Her first step towards implementing this goal was to establish Blue Gully Sanctuary – setting aside 50 acres of hillcountry, revegetated to its original indigenous state and protected under the government’s Land for Wildlife scheme. Home to nearly 200 species of native wildlife, this patch of bushland soon became the ideal setting for our guided Llama Eco-Treks, enabling visitors to experience its unique bushland magic. Complementing this development, she founded Kingbilli Wildlife Refuge – introducing us to the rewarding world of wildlife rescue and rehabilitation. The Sanctuary made it possible for rehabilitated animals to benefit from a ‘soft’ release on the property, following access routes to Blue Gully and the ranges beyond … and created the added bonus of allowing wandering guests to catch glimpses of these fascinating furry creatures, many of whom lingered within our boundaries. The list of projects continued, and to assist her in these tasks, Georgina signed Kingbilli up to the HelpX Program – an exciting concept of cultural exchange which enabled young travellers, from both home and overseas, to stay on host properties, working a few hours each day in exchange for room and board. The program proved a great success. Not only did we meet and, more often than not, form lasting friendships with these adventurous young folk emanating from all corners of the globe … but the wish-list of “we’ll get to that later” jobs it seems every farming family has displayed on the refrigerator door, diminished rapidly – and Georgina had the extra hands she needed for her own conservation plans. 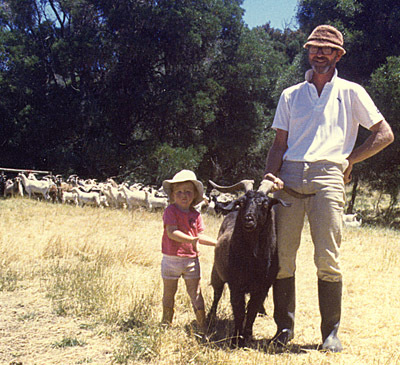 In 2001, the caprine aspect of our farming enterprise changed course. 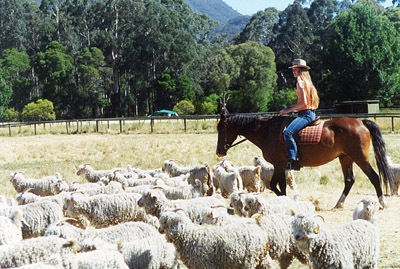 For several years we had questioned the feasibility of continuing to run cashmeres in our bitterly cold winter weather … however Georgina did not wish to cease farming goats altogether. After some months of research, she began restructuring our goat enterprise, transferring the emphasis from cashmeres to angoras. Her reasons were simple. Cashmere bearing goats were dual-coated animals … having a covering of coarse guard-hair, through which grew the cashmere undercoat. This soft downy fibre made its first appearance in December, reaching full fleece in July/August, after which it shed naturally with the onset of Spring. In countries such as China, Mongolia and Iran, goat herders brushed or combed the cashmere ‘down’ from the animal prior to its shedding.This harvesting process ensured goats retained protection from the winter cold, as the original guard-hair remained. 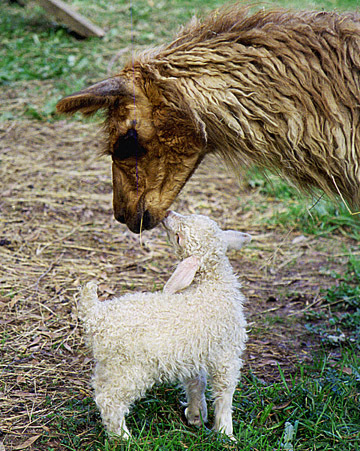 However, in other countries, like Australia and New Zealand, cashmere goats were shorn like sheep … and shearing had to take place during July, before the fleece began to matt. Once shorn, with no guard-hair remaining as protection, the cashmeres were particularly susceptible to our icy winters … frequently needing housing and hand-feeding for anywhere up to 4-6 weeks. Over the years, as our flock numbers grew, this became increasingly impractical. Angoras, on the other hand, were an entirely different proposition. Single fibred animals, their fleece growth was rapid and constant … thus they were shorn twice-annually, and shearing times could be altered to suit individual climates. In May 2001, having formally taken ownership of Kingbilli, Georgina purchased her first small group of does – in kid. A new venture for a new millennium … and a new generation to run it. In farming terms, we’d come full circle. Once again, Kingbilli’s hills were alive with the sound of goats. For several years the development of angoras took centre stage, with much time spent improving stock quality, attending shows, conducting sales. But before long, in place of icy winters, the over-riding problem became drought. Although we love this ‘sunburnt country’ once again the purchase of feed became increasingly difficult. How best to deal with it was a subject constantly discussed … with no easy solution found. Then without warning, the two local primary wildlife shelters closed, the retiring operators handing the reins to Georgina. Suddenly she found herself responsible for covering the almost 4000 square kilometre territory which formed the Murrindindi Shire. It was crunch-time! On 24-hour call, tending to some 60 cases annually, she realised something had to go … and the goats drew the short straw! Over the next two years, goat numbers were reduced, to be replaced by furry critters of all sorts. The thumps of bounding feet accompanied the curious noises made by these enchanting critters as they claimed ownership of the Homestead gardens, the hills and our hearts. No nook or cranny of the property was off limits to them. The agricultural side of the property was restructured to concentrate solely on our llamas, donkeys and horses, with the addition in mid-2013 of three gorgeous new pinto Shetland ponies. Unexpectedly, in 2009, two additional wildlife shelters had opened their doors in the district, and thankfully, Georgina was able to ease back on her “front-line” rescue work – and instead, focus on assisting urban-based shelters in finding a suitable place to relocate animals in their latter stages of rehabilitation, where they could be properly prepared for release back into the bush. 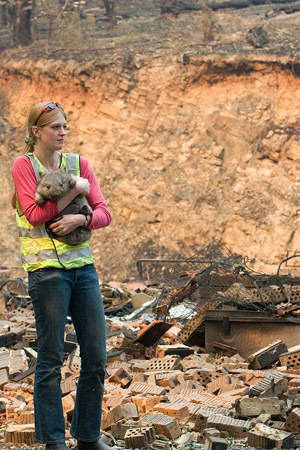 This process had become paramount following the Black Saturday bushfires, throughout which Georgina ran the Wildlife Triage Centre on the northern fire front with the assistance of some truly extraordinary people. Then, once the last fire casualty had been rehabilitated, Kingbilli Wildlife Refuge changed from being an intensive-care hospital to a “halfway house”, with great success. So, apart from occasional animal related baby-sitting duties (grandchildren of the human variety not having arrived at that point) … we old folk began to take life at a more leisurely pace. 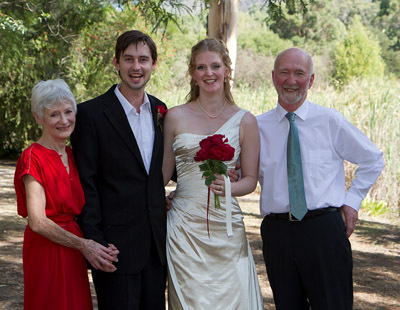 Then, in early 2014, one of the loveliest ever events took place at Kingbilli – Georgina was married, to her long-awaited knight in shining armour, Simon Covington. A country boy from Yellingbo, Simon and Georgie’s paths had crossed, quite literally, but wholly unknowingly, countless times as their adventurous young lives unfolded either side of the ranges – to an extent all but worthy of a Mills & Boon novel. Until finally, in 2012, their timing clicked as perfectly as their daily travels… so they met, and fell in love. With a history, lifestyle and general approach to existence so extraordinarily similar to one another, the Beach and Covington families fell into step as easily as their respective offspring… and on a glorious Summer’s day, in front of a small gathering of favourite friends, the enchanting young couple tied the knot. Then along came Daniel James Covington … our grandson! A dark-eyed, coppery-headed beautiful, bouncy babe, who stole our hearts from his very first moment … and continues to fill each day with joy! 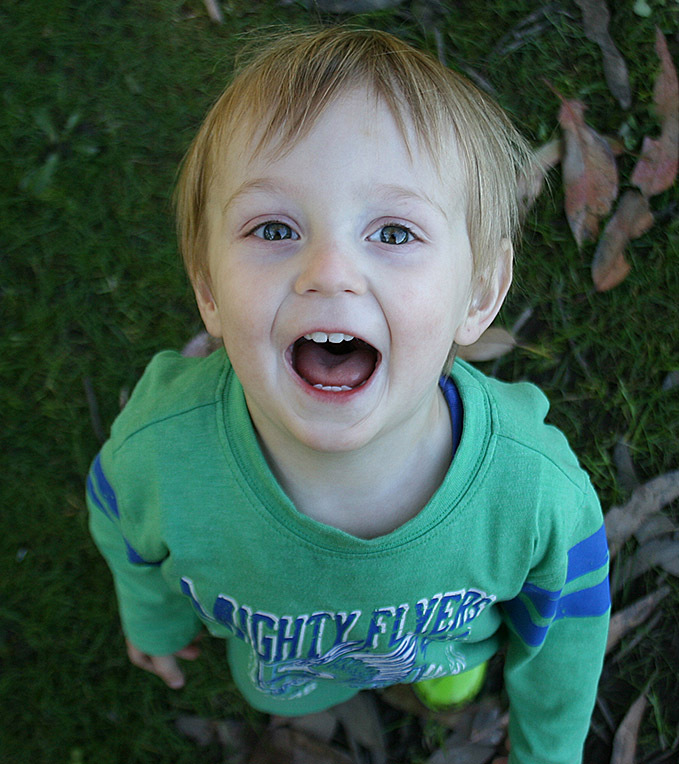 Daniel is a happy, inquisitive child, who seems never to stop. 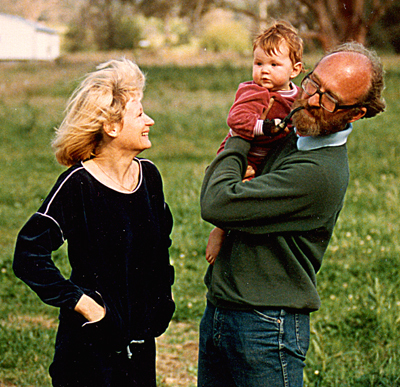 As a tiny mite, he was carried everywhere in a baby-harness attached to Georgie’s front, but by 3 months that had been turned around so he could more easily view and assess the world, rather than snuggle up and sleep as presumably the manufacturers intended. He ‘helps’, remarkably effectively for one so young, with all manner of farm-based activities, and is quick to offer advice, especially to his father, if he believes it is required! As I imagine you have concluded by now … we are completely entranced by this youngest addition to our family … Kingbilli’s third generation. Grand-parenthood has proved so much better than we could ever have imagined. We are so very lucky! Today, the future is looking very bright indeed. Sometimes late in the day, Mike and I still climb to the top of the hill. It takes a little longer now … but the spectacular 360-degree views from the ridge make the effort worthwhile … continuous waves of green rolling hills to the north, a patchwork quilt of farmland bordered by the Black Range to the west, the Great Dividing Range to the east … and directly ahead to the south, the steep rocky escarpment of Cathedral Mountain. In the valley below lies Kingbilli, its stone buildings partly hidden by trees, its creatures great and small grazing contentedly in its paddocks, its trio of dams shimmering in the evening light – a haven of peace and tranquillity. The dream has become reality.